Spot loves his toys, and so do all his friends! In this new addition to the popular landscape board book series, Spot's friends play all day with his favorite toys-cars, trains, balls, and blocks. But Spot's most cherished toy of all is for him alone-his teddy bear! Full of toys and play, this book is sure to be loads of fun for young children everywhere. Spot loves reading! 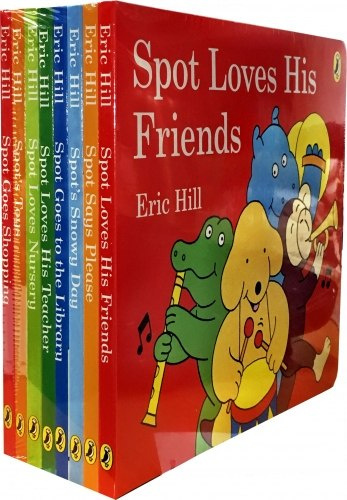 Join Spot in this new storybook by Eric Hill as he visits the library for the first time, listens to a story and borrows lots of fun books to read at home. Going to the library can be an exciting new first experience for young children - there's lots to learn about choosing a book, taking it to the counter to get it stamped, then taking it home to read and remembering to return it to the library on time. Libraries are the perfect place for young book lovers, and Spot is no exception. When it is snowing Spot likes to go sledging, build a snowman, throw snowballs, go skating with his friends and then drink hot chocolate by the fire with Grandma. 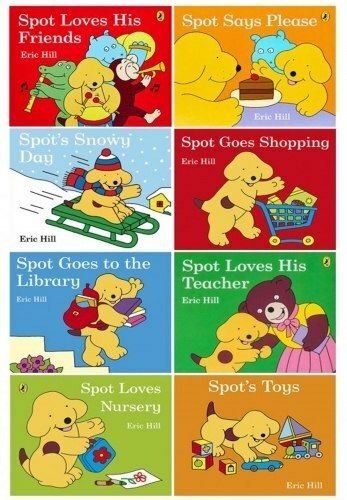 Young readers will love sharing all these favourite winter activities with Spot. Spot Says Please by Eric Hill: a brand new story all about manners. Spot and his friends are learning that being polite is a rewarding experience. This useful book will help children to begin to use those all-important words, 'please' and 'thank you', as they learn alongside the loveable puppy, Spot, and all his friends. Spot and his friends have a playdate. Spot's friends each have favorite things they like to do. Tom Alligator flies kites, Steve Monkey climbs trees, and Helen Hippo rides her bike. Spot likes doing them all, and he loves all of his friends, too! Children will love watching Spot play with his best buddies in this fun new board book.